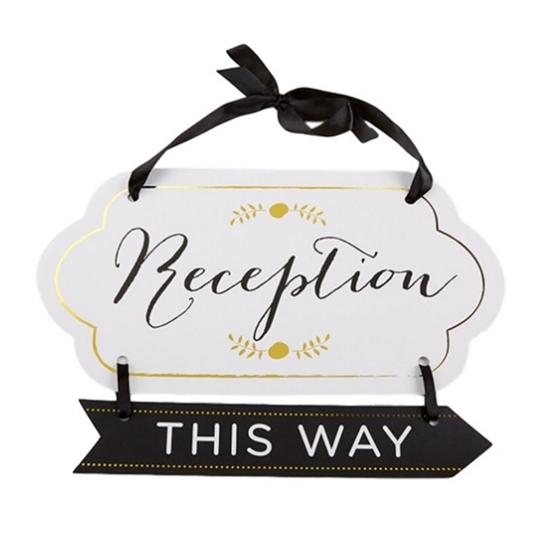 Featuring gold detailing on the borders and the word 'Reception' printed in black, this white card stock sign is a useful tool at guiding your guests. Included with your purchase is a black ribbon handle that can be attached to an additional reversible black arrow sign that comes printed with the words 'This Way'. The sign measures 15.8 inches by 0.2 inches by 11.8 inches overall. A useful tool to ensure your guests are comfortably guided towards the reception, the Gold Accented Reception Sign is a wise buy. Furthermore, with the decorative font and gold detail at the borders, the sign makes sure it is in line with your ceremony’s aesthetic.